Chief Minister Prem Kumar Dhumal released a ‘Practical Handbook on Public Health Engineering’ authored by Shimla based engineer, G.S.Bajwa, here today. 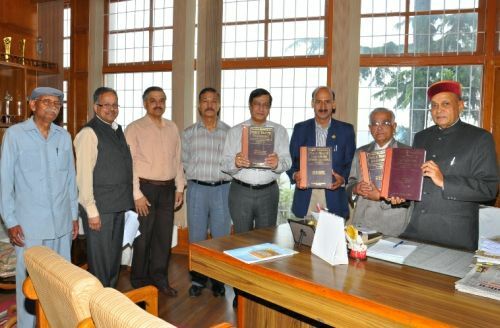 Practical Handbook on Public Health Engineering is the first book on fascinating subject ‘Water’ the most precious gift of nature and elixir of life is based on long experience of the author who is well versed with the world’s one of the oldest water supply system developed for Shimla centuries ago. Chief Minister congratulated G.S. Bajwa for bringing out the handbook. G.S.Bajwa, author of the book threw light over the contents of the handbook and said that the book would be of immense value to the planners, executors and designers of water supply schemes in the State since the contents were not only theoretical but also made practical for implementation. Ravinder Singh Ravi, IPH Minister, S. Roy, Chief Secretary, T.G. Negi, Additional Chief Secretary, Dr. Arun Sharma, Principal Private Secretary to the Chief Minister, R.K. Sharma, Engineer-in-Chief, IPH, and other senior officers were present on the occasion.